"Let it go....let it go...."
Months and months after the initial release of Frozen, the world is still in the middle of "Frozen fever" with its music still being played on radio stations, DVD sales through the rough, and live cast performances continuing to this day-even as the summer months quickly approach. However, if there is anyone who is refusing to "let it go", it's Disney-who decided to give us a look the upcoming villain for the next season of ABC's hit fairy-tale series, Once Upon a Time. Once Upon a Time is not strictly based around characters in the Disney film universe, but around other fairy tale characters such as Little Red Riding Hood, Dr. Frankenstein, and the Wicked Witch of the West (which is hilariously ironic if you know anything about Idina Menzel), but with Disney's ownership of ABC, it is no wonder why Once Upon a Time is rich with characters such as Captain Hook, Snow White, Mulan, Pinocchio, and many more, including the latest addition to its incredible Disney line-up. It has been confirmed that Elsa will be playing the lead villain for the upcoming season, so it is likely they will be using the character much closer to the initial concept of the film, where she would become evil, which is more along the lines of the story the film is loosely based upon-The Snow Queen, written by Hans Christian Anderson. Whether or not other characters from the film would be appearing has yet to determined. 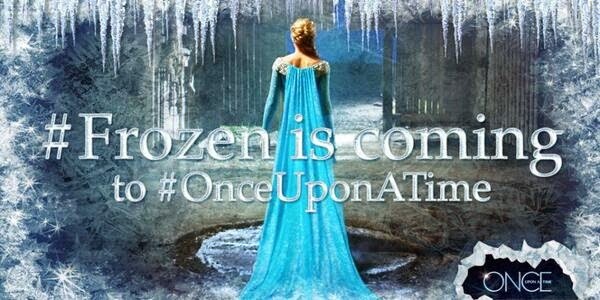 Be sure to catch Elsa as she brings a chill to Storybrooke in season 4 of Once Upon a Time, coming this fall to ABC.